India is truly a captivating country to visit, there is possibly no other country on earth that challenges the senses and is so totally addictive; creating memories that truly stand the test of time. 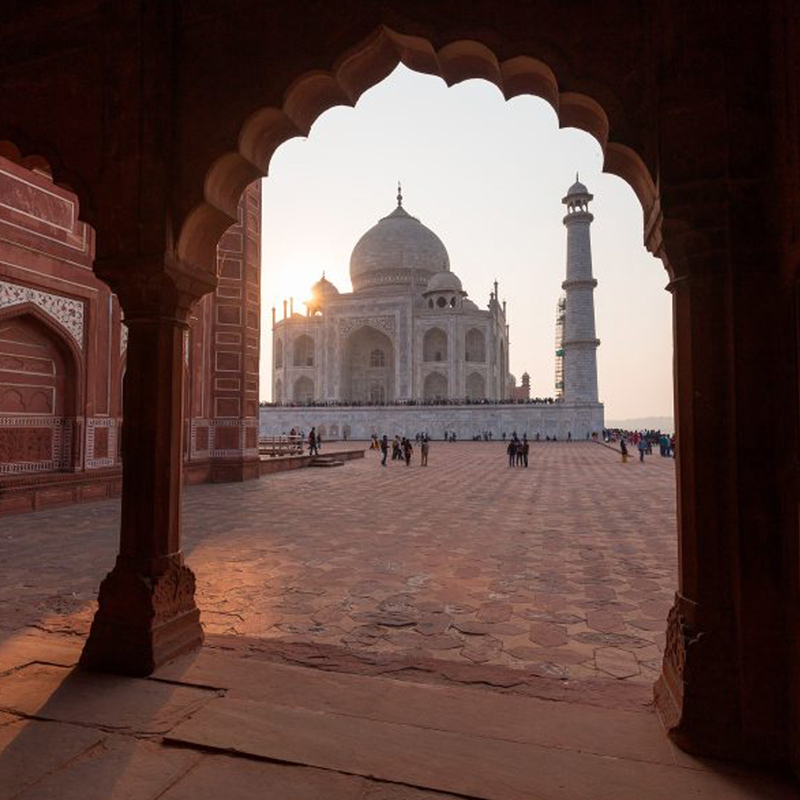 Enjoy this fascinating introduction to northern India as we explore the bustling streets of Delhi, search for Bengal Tiger in their natural habitat and visit the magnificent Taj Mahal at sunrise. We also visit a hilltop fortress, stay in villages on the desert plains of Rajasthan. SUMMER ITINERARY - During the summer months Ranthambore National Park is closed so there is no option to take a jeep safari in search of tigers. Instead we spend time in Karauli, staying in an old Maharajah's house and taking a camel cart ride to explore the former Royal Palace. This trip allows the option for triple rooms to be included within the booking on a selected number of night stops within the holiday. If you would like this option, a discount may be applicable on the cost of the trip - please ask our Sales team for further information. Arrive in Delhi and check in to our hotel. The Indian capital has long been a phoenix rising again and again out of its own ruins. New Delhi was the creation of the British Raj of the 30's and our tour includes a look at the Lok Sabha building (Parliament), India Gate, the Rajpath and Qutb Minar. We plan for a quick turnaround after arriving at the hotel to get out and explore the city however if you wish to relax after the flight it is possible to opt out of today's sightseeing and relax at the hotel. Compared to New Delhi the Old City is much closer to the image conjured up by Rudyard Kipling. We travel by cycle rickshaw to its hub at Chandni Chowk Bazaar, a jamboree of deafening barter and a wonderful introduction to the 'real' India. The major sights nearby are the Jami Masjid Mosque and we pass by the Red Fort on our way out of the city. We drive to Agra which takes approximately three hours. In the afternoon we plan to visit Agra Fort, built by Akbar the Great, which contains the incomparable Moti Masjid (Pearl Mosque). Before returning to the hotel we will get our first sight of the Taj Mahal in the evening light. This morning we aim to visit the Taj Mahal, the world's most perfect and poetic building, at sunrise. Over 300 years have elapsed since its construction, yet it stands today unscarred by age; its beauty and symmetry seemingly beyond man, time and space. Created by Shah Jahan as a funerary monument to his favourite wife, Mumtaz, it took 22 years to build (1630-52). The Great Moghul lies beside his beloved under the white marble dome. Inlaid with precious gems, the building cost a fortune. Later Shah Jahan moved his capital to Delhi before being overthrown by his son, Aurangzeb. After breakfast we will drive to the entrance of Keoladeo Ghana National Park. Formerly a royal duck-shooting reserve and now an ornithologist's paradise, the sanctuary is best visited either at dusk or dawn. Covering 12 square miles, some 7000 acres are under water: the lakes and marshlands offer a safe habitat for large numbers of breeding waterbirds and migrants. More than 300 species have been sighted, among them herons, storks, geese and the huge and rare Siberian crane. We will be taken on a birdwatching tour by cycle rickshaw and we hope to see some of these magnificent birds. This afternoon we will head to the train station to catch our train to Ranthambore (approximately 2 hours). Ranthambore is one of the best examples of the country's tiger conservation projects. The best chance of sightings is between September and May. During this period water is scarce and the animals must stay close to the lakes and river. It is little wonder that this was once one of the best hunting areas of the Maharajahs. We include a game drive this morning into the Reserve, in search of the wildlife which, as well as tiger, includes sloth bear, langur, jackal and fox as well as crested hawk eagle, crested serpent eagle, jacana, parakeet and white-breasted kingfisher. The park itself is very picturesque with lakes, rivers and forests surrounded by steep cliffs and rocky outcrops. In the afternoon there is another opportunity to do a game drive to get a chance to see more wildlife and views. The vehicles used for game drives are open top jeeps, with 6 seats and ideal for spotting wildlife. Due to regulations aimed at keeping traffic to a minimum in the parks we cannot guarantee exclusive use of the jeeps so you may be sharing with non-Explore customers. Please note that because the jeeps can only accommodate 6 people there is a chance we may have to split family groups up, this will depend entirely on the make up of your group and we will avoid this wherever possible. Day 5 - Optional game drive before driving to Pachewar, heritage hotel. This morning there is chance for an optional game drive before we drive to Pachewar (approximately 4 hours' drive). A small village, Pachewar is famous for cenotaphs, blue pottery kilns, metal toy makers and interesting surroundings. It is a lively place that was once ruled by Khangarot Rajputs. The caretaker of Khandar, Thakur Anoop Singh Khangarot, had captured the fort of Ranthambore from the captivity of Marathas and annexed the fort to the state of Jaipur. The pace of the trip slows as we stay two nights at a family run heritage hotel, Pachewar Garh. This fort with its huge ramparts, turrets and gates, was built about 300 years ago and bears testimony to its rich heritage. After checking in, the rest of the afternoon is free to explore the village and sample first hand traditional rural life, you may even see villagers partaking in a game of cricket! This evening there is a puppet show at the hotel. Day 6 - Full day in Pachewar, rural Rajasthan. Village walk, cooking lesson and farm visit. This morning head out exploring the village on foot, visiting the local temple and a village home where we have a cooking demonstration showcasing traditional Rajasthan cuisine. Later in the afternoon head to a farm giving us a great opportunity to meet local families and see more of rural life in India, this is India's most colourful regions, it's not uncommon to witness sari-clad women carrying terracotta pots of water. There is ample time to relax at our heritage fort hotel, for an added bit of fun the hotel provides traditional Indian costumes to wear at dinner. Day 7 - Drive to Jaipur, afternoon tour of the Pink City. After breakfast we drive to Jaipur taking about three hours, there is always something new or different to see along the roadside in rural India. Sometimes called the Pink City, Jaipur was first painted terracotta pink by Maharajah Sawai Ram Singh to celebrate the visit of Prince Albert in 1853. This afternoon we will take a city tour with our Explore tour leader. We will visit the lavish and well preserved City Palace with its fine collection of textiles, costumes and armoury and the Palace of the Winds, a 5-storied façade (built about 1760) which has been the subject of countless Indian posters. Jai Singh, the great Maharaja astronomer, built his extraordinary (and very accurate) stargazing Observatory here. The Old City has several fine gates let into the pink walls, and there are many opportunities for photos and shopping. There is an optional puppet show at the hotel this evening or you may wish to see a Bollywood movie at the local cinema. Day 8 - Full day in Jaipur. Visit the Amber Palace and Fortress. Today, we drive the short distance to the foot of Amber Palace and drive up to the gateway. This impressive hilltop fortress possesses what must be the world's finest Chamber of Mirrors and also affords glorious views of the surrounding plains. We will visit the palace after which we will return to Jaipur. Sometimes called the Pink City, Jaipur's palaces and fortified walls were first painted terracotta pink by Maharajah Swai Ram Singh to celebrate the visit of Prince Albert in 1853. This afternoon has been left free to explore more of Jaipur in your own time. You may choose to visit one of the famous bazaars which are bursting with delights, from marble statues to antique textiles; traditional print blocks to local musical instruments. National rail museum - Weekday entrance fee is INR 50 per person, a reduce rate of INR 10 applies for children aged under 13. Entrance fees are double over weekends and government holidays. Transport to and from the museum will be at additional cost. Akshardham Temple - free entry. The temple is closed on Mondays and on national holidays. Transport costs to and from the temple will cost extra. Embark on a journey to discover the city of Jaipur like never before. Today, vroom around the city on a pop pink coloured e-scooter with a woman driver at the helm. The Pink City Rickshaw Company identifies women from underprivileged backgrounds and trains them how to ride e-rickshaws and conduct tours of the Old City. Aged between 18 and 45, these women hail from diverse socio-economic scenarios and are fighting stereotypes to hit the road. Explore the city's iconic structures like Hawa Mahal and navigate your way through the famous bazaars - Johari Bazaar, Maniharon ka rasta as you browse through the block-printed accessories and handcrafted souvenirs. Approximate cost INR 1000 per person, transport to and from the old city will be at additional cost. During the winter months a puppet show is provided by the Mandawa Haveli hotel in Jaipur lasting approx 45 minutes. There is no charge however a tip at your discretion is appreciated. Bollywood movie between INR 350 and INR 450 per person plus transport costs. In general only lightweight clothing is needed during the day. Local people may be offended by western styles of dress and brief shorts, tight fitting clothing etc, should be avoided by both men and women. Comfortable shoes for walking, and sandals. Binoculars are useful for bird viewing. Also a 2 litre water bottle, a torch, insect repellent, sunhat and high factor suncream. For this we suggest £30 per family member. Accommodation in India is as varied as the country itself. On our tours we stay in a mix of hotels, heritage properties, camp sites and homestays. Standards do not equate to standards in the UK and it's best to approach each type of accommodation with an open mind. Service can be slow in places especially when travelling with a group. Hot water is not always available 24 hours a day in some of the smaller properties, and with a group staying you might find if you are showering last you may miss out on the hottest water. Please note that for this trip we require a photocopy of your passport a minimum of 120 days before departure. These are required to apply for the safari permits, which are needed to take part in the tiger safaris in your itinerary. It is essential we have your passport copy before this time, as without this we may not be able to secure the permits before you depart. Indian Odyssey: Arriving in India, whether for the first or tenth time, is a real adventure. Tuk tuks, taxis and rickshaws jumble for space on the roads in what, at first, appears chaotic but on closer inspection works like a carefully choreographed dance. You’ll never forget the look on your children’s faces, eyes out on stalks at the sights, sounds and smells and sheer awe of this truly beautiful country. 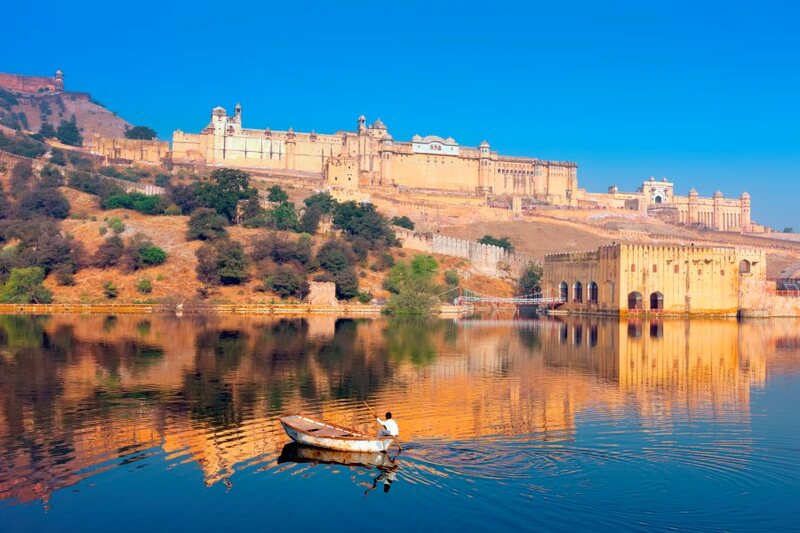 Discover the desert landscapes of Rajasthan and the trio of cities that make up The Golden Triangle. India is a country your children will remember forever. Triple rooms: This trip allows the option for triple rooms to be included within the booking on all night stops within the holiday. If you would like this option, a discount may be applicable on the cost of the trip - please ask our Sales team for further information. India is an amazing place and this adventure combines the historic Taj Mahal and Amber Fort with game viewing to see tigers. This holiday is for families who enjoy discovering new cultures and regions of the world and want to immerse themselves into its cuisine, people and traditions (along with viewing tigers ! ).